MaxLife provides long-life protection by means of a unique patented formulation with superior anti-corrosion inhibitors and anti-scaling chemistry. Protects the cooling system against freezing and over-heating by keeping it clean. 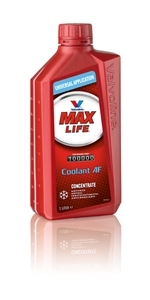 MaxLife coolant protects modern vehicles with aluminium engines as well as older engines with cast-iron engines against corrosion and scaling. It extends the life-span of the cooling system.